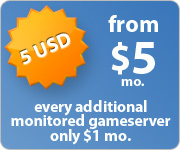 gameME Stats is a service to keep track of the players of one or multiple gameservers. A webpage containing the statistical information, ingame queries and several other features are offered through gameME Stats without the need to install any software on the gameserver. Costs inclusive of VAT. No shipping fees. The rcon password is required to be able to communicate with the gameserver and display messages ingame. The password is submitted encrypted, saved secured and will be treated confidentially. A domain is required to find and access the website with rankings and statistics. It is possible to use a subdomain of gameme.com, so it is not necessary to have an own domain. However, you can also set your own domain or change the domain setting later within the control panel like any other option. Since this email address is the only possibility for us to contact you, please make sure it is correct. Also, make sure you can receive emails, your mailbox is not full and no SPAM rules are blocking our emails.